This primitive campground offers a scenic view of the San Francisco Peaks and dry camping in the cool aspen trees that surround Lockett Meadow. This is a terrific campground for those who cherish a real mountain camping experience and love to hike wilderness trails. You may catch a glimpse of the natural residents, porcupine or elk or thrill to the song of a hermit thrush that sings his best here. Even black bear have been known to stroll right through groups of picnickers without as much as a glance at their lunches. 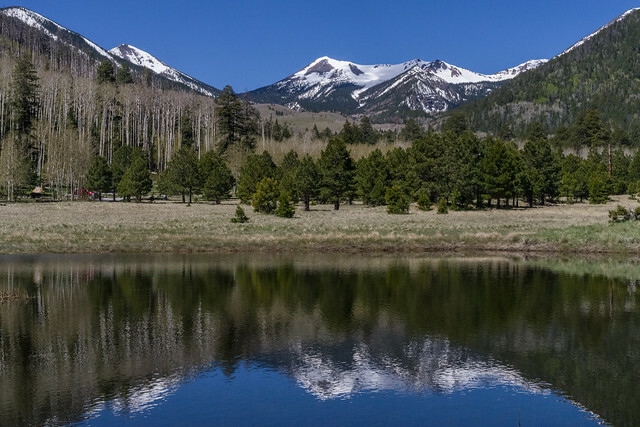 The San Francisco Peaks are actually the remains of an extinct volcano, which mllions of years ago shattered and reshaped these great peaks, forming four of the highest individual peaks in Arizona and is home to the only region of tundra in Arizona. Inside the now quiet caldera a lush alpine environment has blurred evidence of that cataclysmic event. The Inner Basin Trail that leads into the heart of the ancient volcano begins in beautiful Lockett Meadow. Starting at this island of emerald, which is ringed with quaking aspen stands and majestic high peaks, it leads into the mountain’s now quiet Inner Basin. The spring and summer wild flowers add a sprinkling of blue, red and yellow to the peaceful scene. While fall turns the extensive stands of aspen, which cover the steep slopes of the caldera, to solid gold, Winter avalanche tracks streak down the talus slopes exposing remnants of old lava flows which bear witness to the mountain’s turbulent heritage. No reservations. This campground is on a first-come, first-served basis. Campsite: $17 per night (up to 8 people). Picnic/Day use (10 a.m. to 4 p.m.) $8 (one vehicle, up to 5 people). Senior and Access Interagency passes are accepted for a 50% discount on single-site camping fees. Other Interagency passes are not accepted. Off-season: Free (before and after the listed "Open Season" when the roads are open, but the consessionaire is not maintaining the site). Attractions: Camping, hiking, mountain biking, wildlife watching, fall colors, photography. Facilities: 17 single unit sites, fire rings, picnic tables, vault toilet (no drinking water available- bring your own water). Campfires are not allowed when the Forest is under campfire restrictions. Horses are not allowed in campground or the Inner Basin. Mountain bikes are not permitted in the Kachina Peaks Wilderness. Motorbikes/ATVs may only be used for entering or leaving campsites and only if they are "street-legal." Pets must always be restrained or on a leash on the Coconino National Forest. Location: 15 north of Flagstaff in the heart of the San Francisco Peaks. Directions: Drive northeast of Flagstaff on US Highway 89 for 12.5 miles. Turn left on Forest Road 552, directly across from the Sunset Crater National Monument turnoff. Follow FR 552 for approximately one mile. Turn right at the Lockett Meadow sign and continue to the campground. This dirt road is closed in early spring and late fall due to snow. This road is not recommended for RVs/trailers due to the very steep, narrow (single lane), and rough road. Day use area. See site description for fees and other information.